It can be a very challenging task to keep a healthy lifestyle and still maintain the plethora of responsibilities that come your way every single day. There is often little or no interest in exercising at the gym when you’ve just gotten a little break from getting the kids ready for school and taking them they’re engaging in a full day’s work and still going back to pick them from school and finally making dinner. With so much to do and too little time it has become like 24 hours is not enough this explains why a lot of us find it very difficult to squeeze out any time at all for personal activities let alone maintaining a healthy life by exercising. One of the most popular sporting activities in the world for working parents is tennis. This is one game that is not only physically challenging; it is also mentally challenging. Tennis provides quite a magnitude of social benefits, and it equally serves as a great opportunity for parents to make influential connections and still offers options for children as well. As a matter of fact, everyone should engage in tennis playing because he teaches coordination and also helps you get the much-needed vitamin d from being in the sunlight while it keeps you fit. As with other sporting activities. If you have engaged in playing tennis before you can attest to the fact that as interesting and fun as it is working the tennis ball forth and back and centre the part where you have to bend and pick up the ball can be very challenging and stressful. In an average tennis lesson, a player hit a minimum of six hundred tennis balls, and our now that is quite a lot of tennis balls. Having to bend down to pick every single one of these balls by hand cannot only be boring but also cause your back to ache as it puts a strain on it. You probably would be asking why you should take up a spot to engage in during your tiny little spare time and more so why you should take on a sport that would jeopardise your back and put you under stress. There is good news for you and your back as there is now a product on the market that allows you have as much fun as you want it in your balls and makes picking them up very easy. The tennis ball picker upper is a very cool looking device that is designed specially to help you pick up your tennis balls while you stand straight. When a lot of us try to picture a tennis lesson one of the things we happily dream about is a hot sunny course in the Mediterranean somewhere in maybe Spain or Portugal, but this usually is not the case. If you have a tennis ball collector also known as a tennis ball picker upper, you can easily pick up as many as sixty tennis balls in just one second, and you can empty all of them into a larger container immediately. 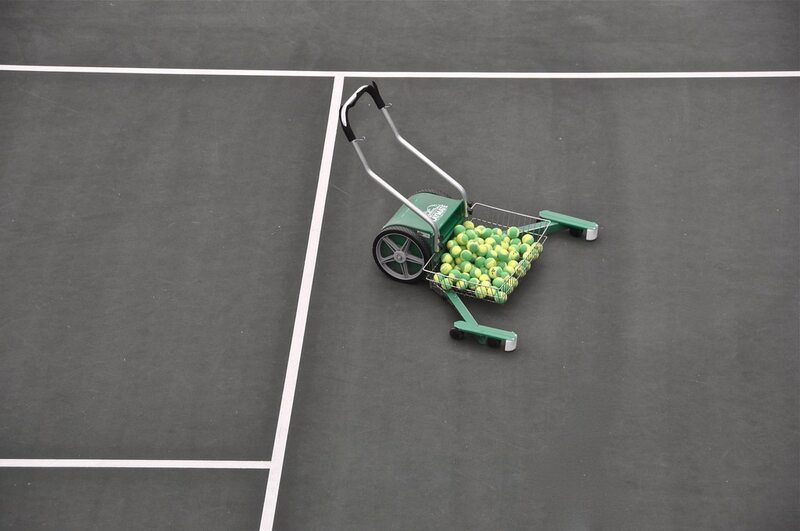 Regardless of the surface of your tennis court, whether it’s a grass court, a clay court, cement or acrylic, these tennis ball collector glides over the balls, and it’s created in such a unique manner as it carries a wire cage that is made with flexible wires. The cage allows the balls to get in and then it closes itself to envelop the balls safely inside. A former GB Davis Cup player, and also co-founder David Ireland said using the tennis ball picker is a little like using a hoover to get your carpet clean only that it is a lot easier. According to him, he has been using the Kollectaball for three years now, and she would not dream of coaching anyone without it. The GB Davis cup player also reported that he had a lot of back issues in the past and parts of the back problem stem from bending to pick up tennis balls and also bending to feed them. He also said that his students totally love using the tennis ball picker and there is even one student who basically comes every day for a chat and an opportunity to use the device. When you go to the market in search of a tennis ball picker, you will find a variety of them, but most of them are quite expensive. The best you can get is a tennis ball collector that uses a big roller system which you can extend its arms to capture your tennis balls. The cheapest ball picker product you can get is the Kollectaball because it cost only 90 dollars while other brands of tennis ball pickers cost as much as 400 dollars even though they all are used for the same thing. One other reason why I am convinced you will enjoy using the kollectaball is that it is very lightweight and that makes it entirely possible for you to carry around. While it can be challenging searching for the right sporting activity to engage in just to stay fit regardless of your tight schedule, I would recommend that you consider getting yourself involved with tennis as it is a very interesting spot and might even become addictive. It doesn’t cost much to get yourself a tennis racket and even join your local club. If you have gone through the process of registering with your local club, or you even decide to set up your own tennis club then it is not too late for you to share this article so that other members of the club can get to know about the tennis ball collector and also enjoy its numerous benefits while they stay fit. Remember staying fit is one way to look younger and live longer even though you have to take care of your kid’s work and do a whole lot with your time it is still imperative that you make out time to stay both mentally and physically fit. Please do not forget to leave a comment below. We are always interested in engaging in conversations with our readers.